My last week away have been summarised by the collage of sorts below. You could say each represented the days spent with Lee Sin in Miyage prefecture, and the Prof Komiya and wife in Iwate prefecture. Visited the area devastated by the March 11 earthquake and tsunami. There is just so much natural beauty here I wish I could express through my lens. Thinking I'd do a quick day trip, turns out I have more reasons to go back again. Happy to be able to meet up again with Lee Sin, encouraged by her OM ministry and blessed by the fact that a fellow Malaysian is here in Japan too. Though so far from Kobe, and ironically never really met though staying in Subang before, I guess when it's meant to be, you will meet up somehow. Though I had to bid Lee Sin farewell and head up north, the main part of my break was to visit the Prof whom I've last visited at his Iwate kampung 5 years ago. I still remember when I escaped to the north when I lost my job during the 2008 recession. They always welcome me with open arms, as if I'm their daughter! The sight of their wooden home in the hills filled me with warm memories of that winter years ago when I felt like I didn't know what to do. I always admire the Japanese who never fail to keep going even when it gets tough. 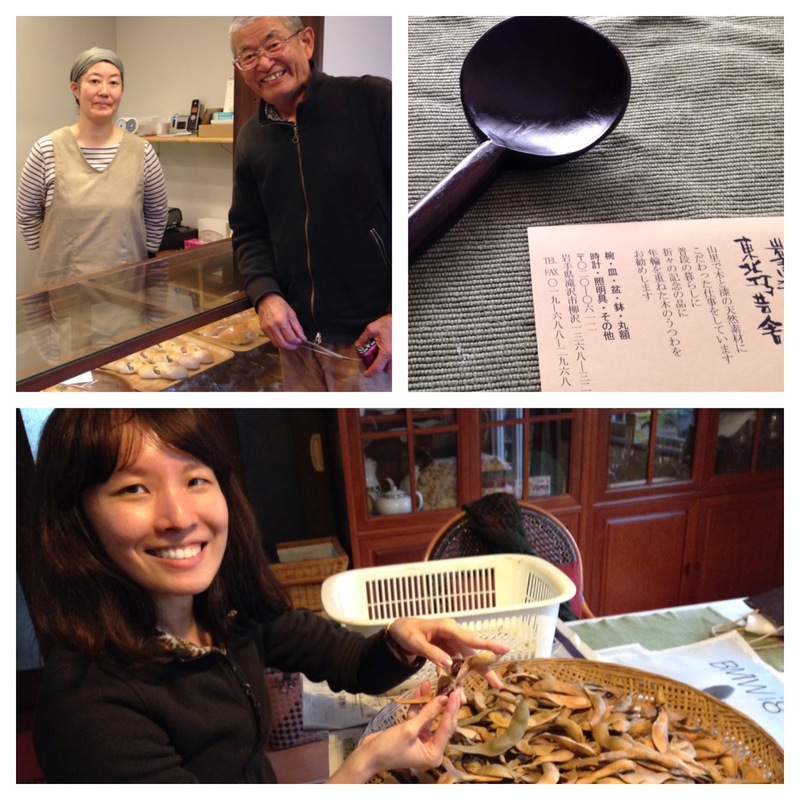 He introduced me to his daughter who moved from Tokyo to start a bakery, and a local friend who specialises in handmade wooden utensils. Though Takizawa is a rural city surrounded by greens, there's a certain charm that reminds me of Hokkaido. The artisan goods reminded me of the online shop my previous company was involved in. I told Sato-san that though Japanese prefer foreign goods, ironically it's the foreigners who are interested in traditional Japanese crafts. Since it was peak period at his farm, I decided to lend a helping hand. 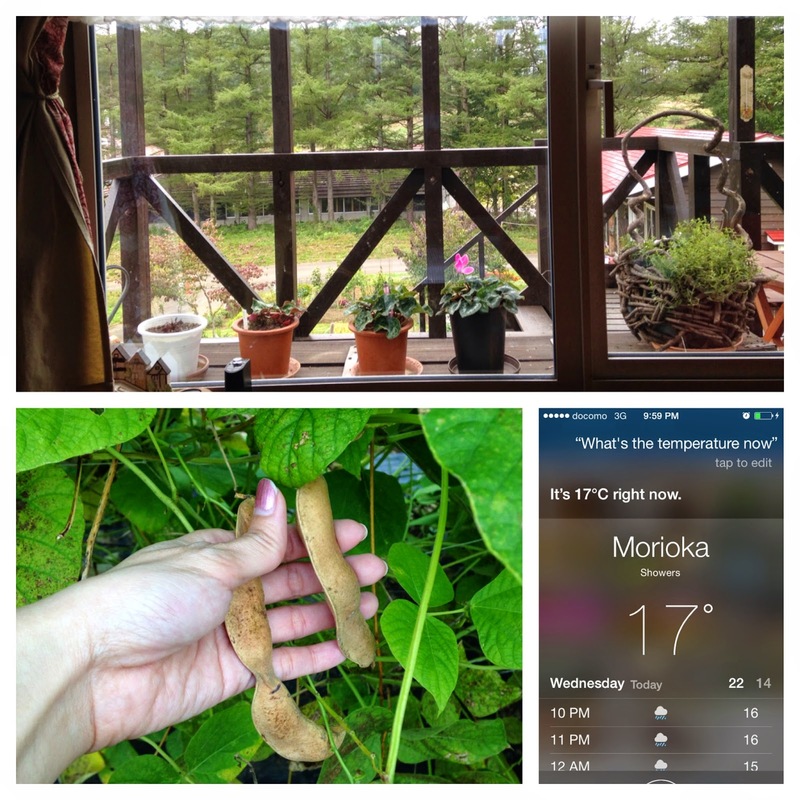 My main task was to harvest the sword beans, and remove the beans from their pods. I'd stay indoors and help whatever I could when it rained. 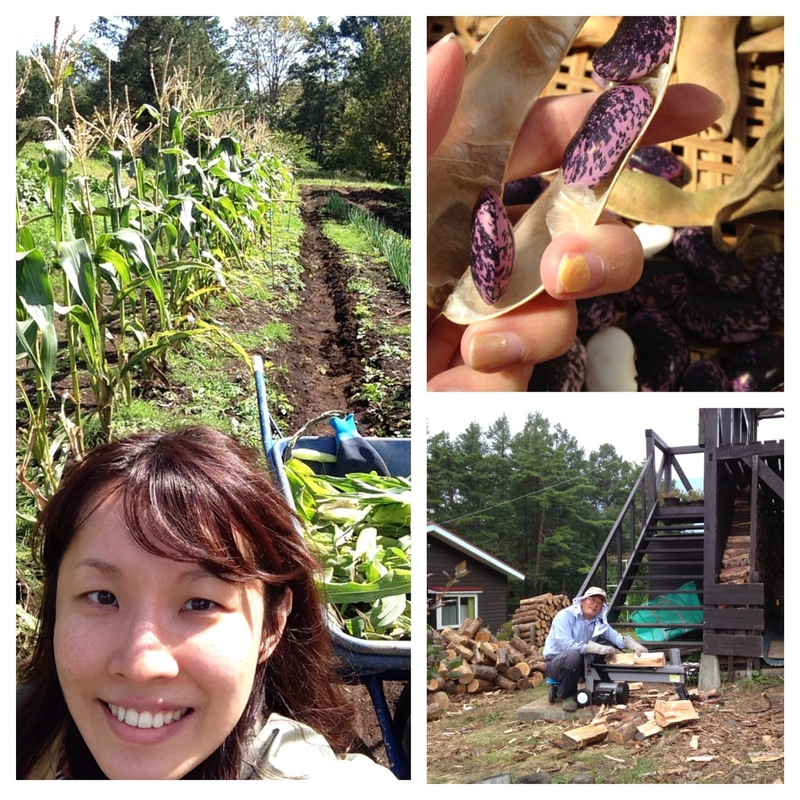 When the sun came out in its glorious form, we harvested corn, removed the malformed ones (it was his first attempt, so not all were fully pollinated), and cleaned up to make way for fresh ones next round. Prof Komiya was happy I was able to help him out, so he could concentrate on cutting firewood in preparation for winter. His wife would be busy with baking, carpentry and housework. Looking at them busying away made me feel very lazy indeed! 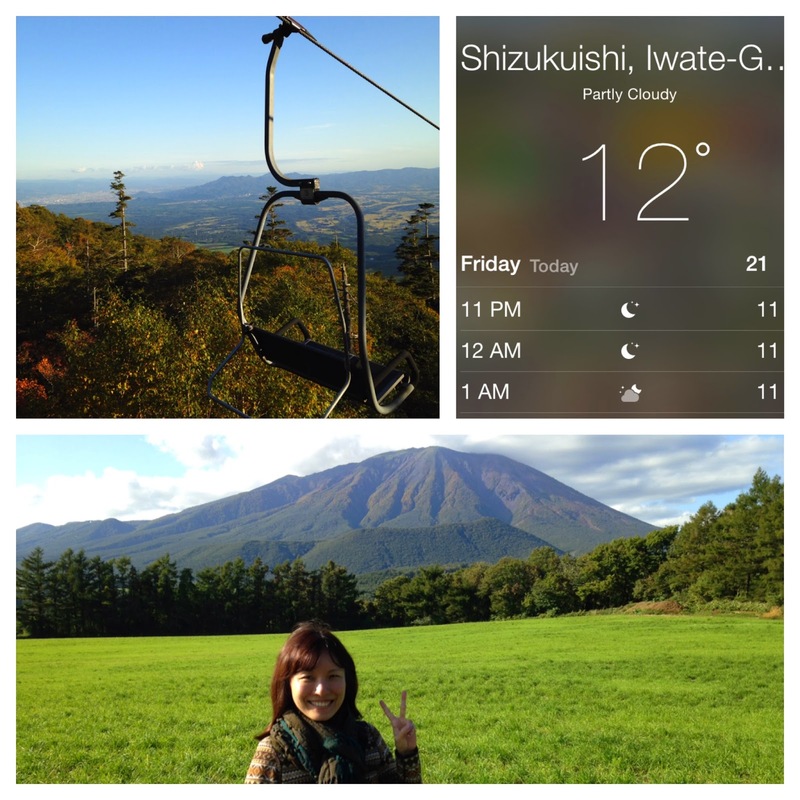 As a "reward" for the "hard work", we took a ski lift up to the mountain to enjoy autumn leaves. 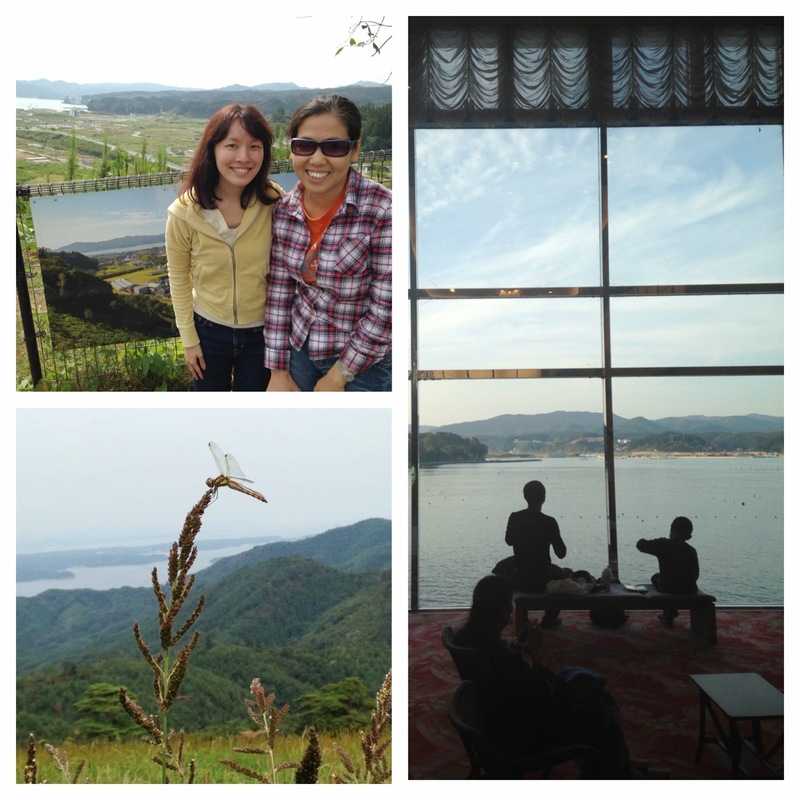 Prof Komiya was so delighted because it was really perfect weather, and we could see the surrounding cities clearly. He had never really been able to do this because of the farm work, and his wife was also busy. Seeing him get so excited about the ride up helped me to forget that it was almost 10 degrees at the top. Now that I'm back in Kobe, I can't help but reminisce about the 5 layers I had to wear last week. It still feels like late summer here, but I'll cherish it while I can.